Panel interviews can be stressful and intimidating, but in a lot of ways, they’re similar to any other face-to-face job interview. And the answers you give will be similar as well, with a few adjustments. 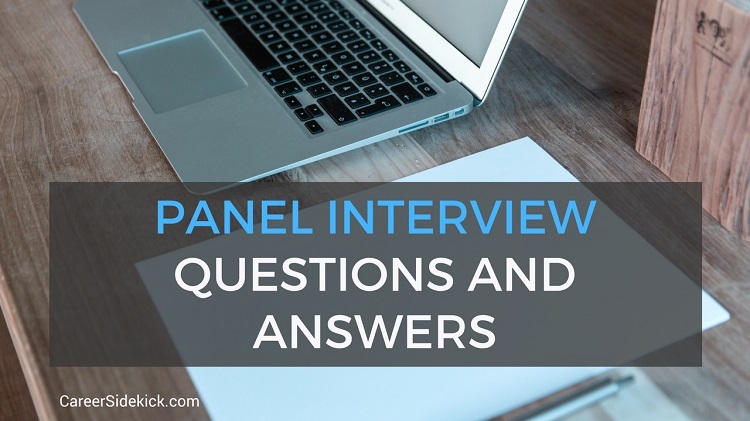 In this article, I’ll cover what to expect in your panel interview, and the common questions and answers to know! First, what is a panel interview? It’s an in-person interview where you sit in a room with multiple people from the company at the same time, instead of meeting with each person one-on-one. Since it’s a face-to-face interview, and it requires the company to get the whole team together, it usually will come after a phone interview (so they can make sure they’re interested in you before spending the time in a panel interview). So the good news is that if you’re on a panel interview, they’re probably interested in your background and really thinking of hiring you. So that’s one reason to be confident! In a panel interview, they’re going to ask similar questions that they would in any interview. And your strategy to give great answers should be similar. Do your research and know about their business. Who are their customers? How do they make money? What is their history? Research the job description. What are the requirements? What skills do they want? Those are the things you need to show them in the interview. Focus your answers on THEIR needs. Be familiar with your own background and work history. Prepare stories and examples. Be ready to talk about your own resume and summary of your accomplishments. Be specific – use facts, numbers and examples whenever an answer calls for it. That’s a great way to make your answers stand out in any interview and one of my top interview success tips. Now, those are just a few questions. There are over 100 more questions they could ask. So, you’re better off preparing for topics, not individual questions. I talk about this strategy in my job interview answer guide because it’s one of the best ways to prepare for any interview. Be ready to explain why you’re job searching. That’s one general topic. What you’re looking for, what types of positions you’re targeting, etc. And why their job interested you based on what you’re looking for. Here’s another idea: Think about your communication skills and teamwork skills. Come up with one or two examples of how you worked as a part of team, how you interacted with your boss in the past to make sure your last job was a success, etc. Another topic: Think about what motivates you (besides money). Employers want to see that you’re resilient and will overcome obstacles and stay motivated even if things get tough. So you need to show them this. And even if you do prepare for 100+ questions, they might ask something different than what you expected. So if you want to give great answers in your panel interview, prepare for general topics that you think they’ll ask about. You can get more clues about topics to prepare for by studying the job description. What do they mention most or seem to care about? Communication skills? Leadership? Problem-solving? etc. That’s what to practice great answers for. Show up 10 minutes early. If you’re late you will not get hired. Learn everyone’s names and use them in the conversation. Prepare great questions to ask them. You can direct questions to an individual, or the panel in general. Make eye contact with everyone when giving an answer to a question, but focus slightly more on the person whose question you are answering. If you want more tips, hints and help with your panel interview, I wrote one more article with further details on how to ace your panel interview.